Palestinian Christians say US Vice President Mike Pence’s brand of evangelical Christianity, with its fervent embrace of modern-day Israel as fulfilment of biblical prophecy, lacks their faith’s compassion and justice. Palestinian Christians slam the Christian Zionist views as a negation of the teachings of Jesus. “For me, it’s a sick ideology,” said Munib Younan, the recently retired bishop of the small Evangelical Lutheran Church in Jordan and the Holy Land and former president of the Lutheran World Federation, an umbrella for churches with millions of believers. “When I say Jesus is love, they want my Jesus to be a political Jesus,” Younan, 67, a Jerusalem-born Palestinian, said in a recent interview at his church. Younan said he supports a solution to the conflict with Israel, including the establishment of a Palestinian state in the lands Israel captured in the 1967 Six-Day War. Jerusalem, he said, should be shared by Christians, Muslims and Jews, adding that a peace deal would enhance Israel’s security. Israel, however, view Jerusalem as the indivisible and eternal capital of the Jewish people. The wire service, as usual, misses the point. Munib Younan is very good at portraying himself as someone who supports peace with Israel. But he was one of the first signatories of the antisemitic Kairos Document, which embraces Christian supercessionism, the idea that the church has replaced Israel in Biblical prophecy and Jews who remain Jewish are essentially defective. While Christian Zionists like to quote the Old Testament because they believe that the modern state of Israel can only be viewed through the lens of Biblical prophecy, Palestinian Christians say in the Kairos Document that the Torah is “a dead letter” and that all of it must be discounted – except, of course, when they find parts that they can twist to support their hateful viewpoints. The Kairos document talks of “love” but then spends far more time talking about “resistance,” and not specifying the non-violent kind. It does not embrace a two state solution, rather it calls for a single state where Jews would become the minority. It discounts the fact that Palestinian Arabs engage in terrorism by putting the word in scare quotes and then insisting that the “Occupation,” never defined as only the 1967 lands, is the reason for Palestinian violence. And Kairos is the ultimate political document, despite Younan’s seeming hate for politics. Younan has stated that, for Palestinian Christians, the entire Old Testament looks like a Zionist book – and therefore it must be discounted and ignored. In fact, in Younan’s own church, any mention of “Israel” and “Zion” has been expunged from prayers. The Palestinian problem with Christian Zionism is far deeper than a disagreement over “justice.” It is doctrinal. Israel’s very existence is a challenge to their entire belief system, which values hate for Israel and Jewish nationalism above the words of the Bible. 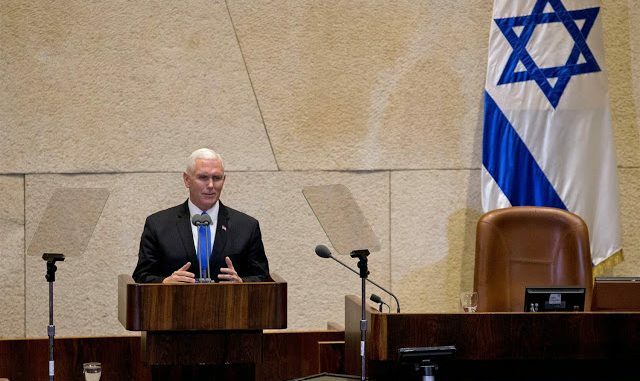 And while Christian Zionists like Mike Pence can easily see the hand of God in everyday life in Israel, Palestinian Christians edit the Bible to conform to their own politics.